Bank of America’s 4Q Earnings: How Much Will Higher Interest Rates Help? The nation's second biggest bank by assets should get a meaningful boost in the fourth quarter from higher interest rates. It seems safe to say that Bank of America (NYSE:BAC) is about to report one of its best quarterly performances since the financial crisis. There are a number of reasons to think this -- from higher trading revenue to lower expenses -- but the biggest reason to be optimistic has to do with the recent surge in interest rates. 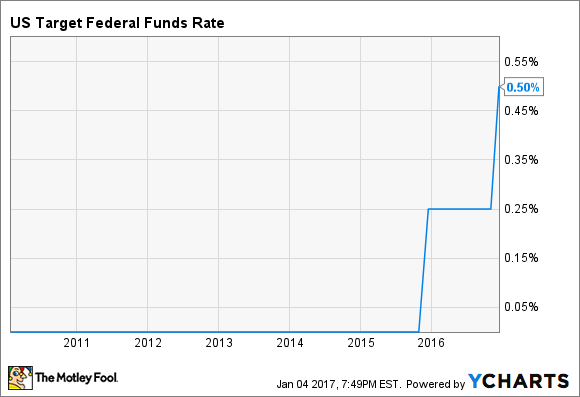 As I've discussed in the past, Bank of America will earn a lot more money when interest rates rise. The bank estimated that, as of Sept. 30, a 100-basis-point simultaneous increase in short- and long-term rates will translate into an added $5.3 billion worth of net interest income over the 12 months after the increase. If you've been following the news of late, then you know this portends well for Bank of America. 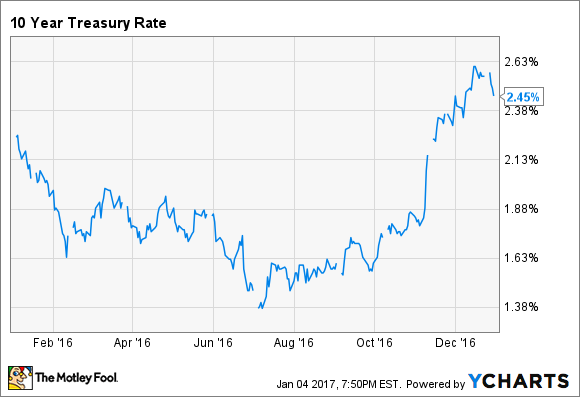 Since Sept. 30, not only have short-term interest rates increased, but long-term rates have as well. On the short end of the spectrum, the Federal Reserve increased the fed funds rate by 25 basis points, or 0.25 percentage points, last month. That's a tiny increase, but it's still worth something. According to Bank of America, a 100-basis-point boost to short-term rates alone (i.e., holding long-term rates steady) would translate into an added $3.3 billion in net interest income. Divide that by four, to account for the fact that short-term rates rose by only 25 basis points, and you get around $800 million in extra revenue each year. You don't have to take this too much further to see how this will help Bank of America each quarter. Divide $800 million by four, to account for the four quarters in a year, and you get $200 million in extra net interest income. That's not a game changer, as Bank of America earns upwards of $4.5 billion a quarter, but it's still nothing to shake a stick at. Moreover, this assumes that long-term rates didn't rise, which they did. In the three months since Sept. 30, in fact, long-term rates increased by nearly 100 basis points. The upward surge in long-term rates should equate to around $2 billion worth of net interest income, based on Bank of America's calculations. That's about $500 million on a quarterly basis. Now, it's important to point out that investors shouldn't expect Bank of America's net interest income to grow by the full $700 million in the fourth quarter, as rates were only higher for a portion of the three-month stretch. Long-term rates rose immediately after the presidential election in early November, but short-term rates didn't move until the middle of December. A fair estimate, then, is that Bank of America should see somewhere around $300 million worth of the increase -- $250 million on the long side and $50 million or so on the short side. Again, this isn't a game changer, but it's unquestionably good news, as most of this should fall to Bank of America's bottom line.